The ‘NHMRC Service Charter’ stipulates that “NHMRC operates within a corporate governance framework that promotes integrity, compliance, performance and efficiency” and “individually and collectively upholds the Australian Public Service (APS) Values”. This is a legal framework under the Public Service Act 1999 that incorporates the core principles: ‘impartial; committed to service (we work collaboratively …); accountable; respectful; ethical (we are trustworthy and act with integrity in all we do)’. A major procedural flaw associated with the Review was the unprecedented exclusion of homeopathy subject, clinical or research experts from the Homeopathy Working Committee (HWC). The NHMRC CEO, Prof Warwick Anderson, personally selected and appointed members to the HWC under s.39 of the NHMRC Act 1992 (see 'Bias' section regarding the CEO's anti-homeopathy public comments). He initially appointed four members to a 'homeopathy reference group' in mid 2011, later expanded to become the HWC from 2 April 2012. The exclusion of consultation or collaboration with homeopathy experts was a key criticism of the previous development of a Draft NHMRC Statement on homeopathy, abandoned due to perceptions of bias and lack of rigour (see 'Bias'). The exclusion exposed the Review to bias and prevented the input of appropriate subject expertise. Part 1.2.2: “Guidelines, advice and peer review would be of lesser quality without relevant experts”. It is unclear why the contractor was required to comply with the requirements of the Standard, whereas NHMRC decided it could choose which of the mandatory requirements of the Standard it would (and would not) observe. "Finally, I am concerned that no homeopathic expert was appointed to the NHMRC Review Panel. I cannot imagine this being agreed in oncology, orthopaedics or other disciplines." ​The NHMRC Administrative Report (p.5) records the dissenting view of a HWC member over the exclusion of homeopathy experts on the HWC, which "was not supported by either NHMRC or the remaining committee membership". The Administrative Report did not record further dissenting views within the HWC, regarding the failure to appoint any homeopathy experts amongst the three expert reviewers appointed in 2014 during the public consultation phase of the Review  - in breach of NHMRC guidelines relating to the appointment of expert reviewers (see below). On 9 April 2014, NHMRC released its Draft Information Paper on its findings on the evidence on homeopathy for public consultation and expert review feedback (required steps in NHMRC’s ‘quality assurance process’). Homeopathy stakeholders, including the AHA (which had corresponded with NHMRC and provided submissions), were excluded from any advance notification during the embargo period - despite the release being a major decision that 'affected them'. The release was also timed to the eve of the commencement of 'Homeopathy Awareness Week', an annual international professional event commencing on 10 April each year. Whether or not the timing was deliberate is open to interpretation, however it did not model 'dignified' or 'respectful' conduct towards stakeholders. On 8 April 2014, the day before NHMRC’s official release of the Draft Information Paper, the anti-homeopathy lobby group Friends of Science in Medicine (FSM) published an open letter to the NHMRC CEO ‘congratulating’ him on NHMRC’s findings. The letter was co-signed by seven of FSM’s founding members and confirmed that FSM not only received advanced copies of the NHMRC media release, but also the Optum Overview Report and NHMRC Draft Information Paper - a privilege that homeopathy stakeholders who contributed to the process and liaised with NHMRC were not afforded. - a phrase directly reiterated by the NHMRC CEO in concluding the Review in 2015 (see 'Bias'). Research protocols are an important safeguard used to reduce/prevent reporting bias in scientific studies. 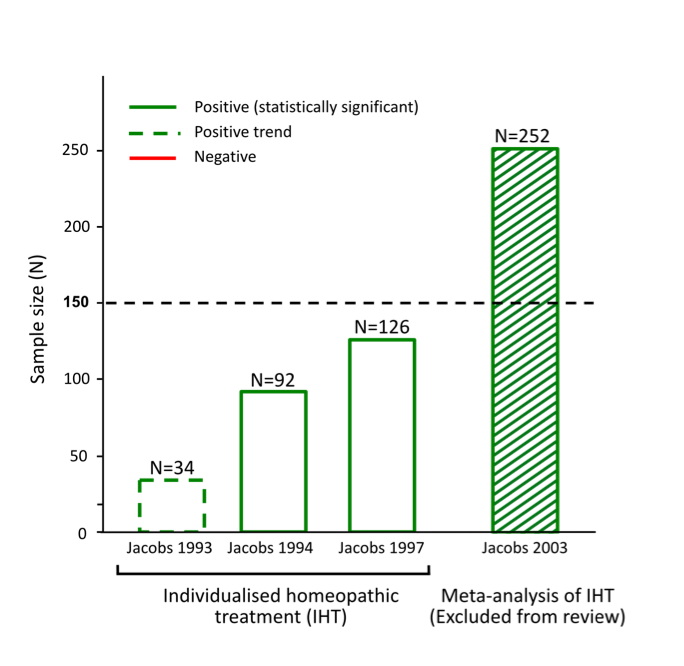 Before a study begins, a protocol is created which outlines in detail all essential aspects of the project, such as the research question being asked, methods of data retrieval, criteria used to determine which studies will be included or excluded from the review, and how the included data will be analysed to produce the final results. Making significant ‘post-hoc’ changes is a recognised source of bias as the reviewers may (consciously or subconsciously) alter the method to achieve a desired result. Hence, ethics committees are often involved in approving changes made. In ethical scientific inquiry, all changes to the research protocol must be fully disclosed and justified. Much of the following information has been gathered from Freedom of Information (FOI) documents released between 2015 and 2016: not reported by NHMRC in 944 pages of report documentation. One the most concerning procedural irregularities of the NHMRC Homeopathy Review was the systematic reconstruction of the research protocol, after it had been agreed and finalised and ​after the contractor (Optum) had completed its evidence assessment. FOI documents and NHMRC files also reveal that NHMRC altered the purpose of the review and the evidence statements along the way. ​Following NHMRC’s rejection of the first review in August 2012 (see 'The First Review'), in October 2012 NHMRC contracted a second reviewer, OptumInsight (Optum) to assess the evidence (NHMRC Administrative Report, p.6), without any reference made to the existence of the first review process. ​The originally agreed research protocol was not disclosed. The 'standardised' evidence statement framework/ criteria for the original 'agreed and finalised' research protocol can be viewed in the margin at right (click to enlarge) . It centred on the criterion of whether a study was 'adequately powered' - which was dropped midway through the Review (see below). Most notably, the original protocol allowed for reporting uncertainty in the results. Thus, where findings were inconclusive (common in all research), it allowed for the possibility that there "may" be an effect, or where evidence was poor and/or 'underpowered', that the effect was "uncertain" - consistent with how research findings are usually reported. This bears no resemblance to the definitively negative 'no reliable evidence' statements developed later in the Review and published. ​Optum began its evidence assessment on 3 January 2013 and completed it by March 2013. This shows that a decision was made post-hoc to deviate from the agreed original protocol in order to alter the results of the Review and reach more definitive conclusions - a clear example of bias. Between April and June 2013, ONHMRC established a HWC Sub-Group process , whose specific task was to develop, entirely post-hoc, the criteria that comprised the published evidence statement framework. NHMRC did not report the existence of this Sub-Group process or its purpose. The Sub-Group was coordinated by senior ONHMRC staff, in conjunction with the HWC Chair, Prof Paul Glasziou and other HWC members..
None of the criteria developed and applied during the HWC Sub-Group process were included in the original research protocol, yet they went on to underpin the framework used for the Review's published findings (Information Paper) and NHMRC's overall conclusion (NHMRC Statement on Homeopathy). The ‘null hypothesis approach’, where homeopathy was ‘assumed to be ineffective unless 'reliable' evidence showed otherwise’ - was introduced midstream by the HWC Chair, Prof Glasziou, in late April 2013, approved by the HWC in early May 2013 . It was not part of the original research protocol. At this stage, ONHMRC/HWC had not yet developed any of the criteria that underpinned its unique concept/ definition of "reliable evidence". The decision to add 'conclusive statements', instead of ‘informing the community of the evidence’ (as per the originally agreed protocol), was adopted midstream on 6 May 2013 . This became 'Element 3' of the revised research protocol's evidence statement framework. The novel, ‘adapted GRADE’ criterion for assessing the level of confidence in the results of the evidence (noting GRADE analysis is designed to be applied only to original studies, which were not retrieved or assessed in the Review) was formulated by the ONHMRC during May 2013 and then applied to the analysis . Optum noted that it was unfamiliar with the tool, which was therefore applied/ guided by ONHMRC . This became 'Element 2' of the revised research protocol's evidence statement framework. NHMRC withheld from public disclosure that its ‘adapted GRADE’ criterion did not pass either round of expert peer review (Australasian Cochrane Centre, ACC) [10A]: advice that was both ignored and not reported. NHMRC also did not release any of its GRADE calculations or tables, in contrast to its other review processes. This was especially odd, given it was a novel modification of an accepted tool. Between June and July 2013, the HWC Sub-Group introduced for the first time the concept of dismissing trials below a minimum sample size threshold from their results being considered in the Review's findings. This was initially set at 200 participants for a trial to be 'adequately powered' on 24 May 2013 , later changed to 150 trial participants for a trial to be 'reliable' in mid July 2013 . At some (unspecified) stage, the new N=150 criterion was linked to a British Medical Journal (BMJ) study published on 24 April 2013 (see below). It meant that any trial that did not have a minimum of 150 participants was automatically deemed to be 'of insufficient size to warrant [any] further consideration of their findings' (IP, p.36) - and was therefore 'unreliable'. The N=150 exclusion threshold became part of 'Element 1' of the revised research protocol's evidence statement framework, alongside another criterion that ONHMRC/ HWC had yet to develop (see below). This criterion was entirely arbitrary and unprecedented. This was also now seven months after the research protocol had been finalised (December 2012) and four months after Optum had completed its assessment (March 2012). 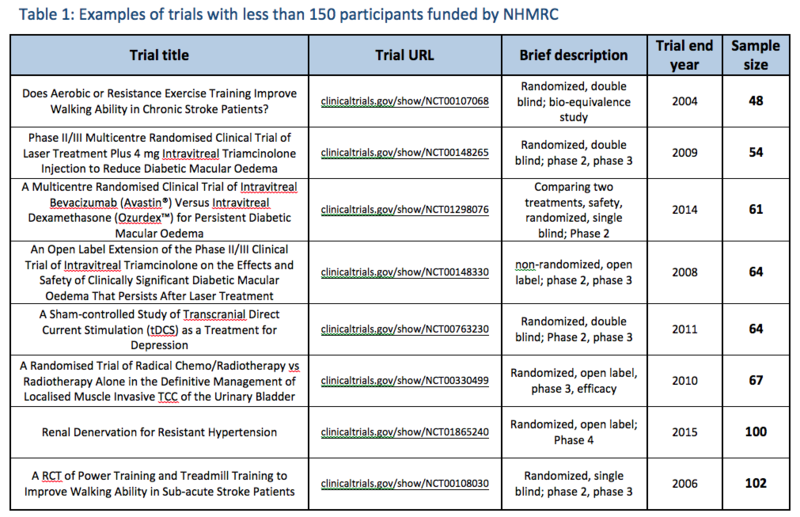 NHMRC regularly funds and collaborates on trials with less than 150 participants, which are not deemed 'unreliable'. The criterion does not conform to any accepted research method and has never been used before or since by NHMRC or any other research group anywhere in the world. NHMRC did not disclose/ quantify the major impact the retrospectively applied N=150 sample size criterion had on the analysis anywhere in its reporting of the Review. Independent analysis of NHMRC's methods and procedures reveals that it dismissed 146 out of the 176 trials (83%) from their results being considered in the Review's findings ​. In the right margin is an example of how this 'rule' enabled NHMRC to dismiss the findings of positive, good quality trials in several medical conditions, to conclude 'no reliable evidence'  (click to enlarge). For further examples, go to the 'Methodological flaws' section. In attempting to justify the N=150 sample size criterion, NHMRC correctly identified the homeopathic studies it assessed as being ‘continuous outcomes studies’ and cited a BMJ paper (www.bmj.com/content/346/bmj.f2304) . That is, not only does the BMJ paper make no link between sample size and trial reliability, it specifically states its findings cannot be extrapolated to the types of trials that NHMRC identified it assessed (‘continuous outcomes studies’). NHMRC uses this citation of the BMJ study against the N=150 threshold multiple times across the final report documents released to the public (Information Paper, FAQ document, Optum Overview Report and in correspondence), who would not question that an expert body such as NHMRC would make such a fundamental error and/or intentionally publish misleading information. On its own, this is an extraordinary error invalidates the integrity of the entire Review process. NHMRC has been unable to credibly justify this anomaly in correspondence . In late July/ August 2013, NHMRC added yet another trial exclusion threshold to the N=150 threshold, as a co-element of its 'reliable evidence' framework. This was that any trial that did not meet an unusually high 100% quality rating (i.e. scoring 5/5 on the Jadad or equivalent using another rating scale) was assumed to be 'not good quality' and therefore "unreliable" . Like the N=150 sample size threshold, this was an arbitrary criterion that did not conform to any recognised research standards; never used by NHMRC or any other research group before or since. NHMRC did not report that the 100% 'quality rating' threshold dismissed a further 25 out of the 30 remaining studies from their results being considered in the Review’s findings . Thus, the entire Review came down to just 5 trials that ONHMRC/ HWC deemed to be 'reliable'. 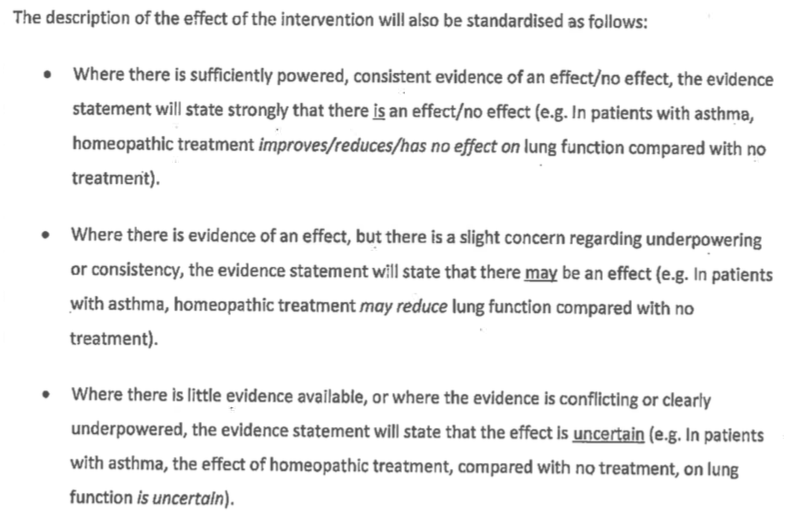 Having reduced the evidence base to only 5 ‘reliable’ trials, the HWC unsurprisingly concluded that there is ‘no reliable evidence’ that homeopathy is effective. Of the 5 remaining ‘reliable’ studies, 4 were interpreted as negative and 1 was positive, meeting NHMRC's own unique definition of 'reliable evidence'. This positive trial had 161 participants and was rated as 'good quality' (5/5 Jadad) . Table 1 of the NHMRC Information Paper (pp.18-20) presenting the findings of the Overview to the public substituted this positive study with a negative study in the same condition (lower back pain)  that was not considered as part of the Overview. Whether or not this was deliberate is open to interpretation, however it is the only one of the 176 trials omitted from Table 1 of the Information Paper. Collectively, these post hoc changes to the research protocol directly resulted in the results of 171 out of the 176 (97%) of the included studies from their results being considered in the Review's findings (at all). NHMRC did not report or quantify this significant impact anywhere in 944 pages of report documentation - despite claiming it conducted a 'rigorous', 'transparent' and 'ethical' review process. NHMRC thereby presented the misleading and inaccurate impression that it had included the 176 Overview studies for review, whereas in fact the results of 171 of these studies were excluded from any consideration in the findings at all. NHMRC misinformed the public that its expert reviewer, the ACC, was “independent” (NHMRC Administrative Report, p.9; Information Paper, p.15), without disclosing that it is 100% funded by NHMRC - an undisclosed perceived conflict of interest exposing the Review to potential bias. In 2014, during the public consultation phase of the Review, NHMRC accepted for assessment an additional 40 studies, 37 of which (93%) reported statistically positive results for homeopathy. All of these studies were dismissed on grounds of having a 'high risk of bias' and/or being ‘unreliable’ as a result of the N=150 sample size threshold rule. The NHMRC Information Paper (p.6, 14) stated that this evidence "was assessed using a similar method to that applied in the overview" - but this was not the case. This evidence was in fact assessed entirely separately and differently to the Overview studies, so that the number of these studies that entered the Overview was 0: making a sham of NHMRC’s apparent attempt at external cooperation and transparency. Contained Supporters of the the anti-homeopathy advocacy group Friends of Science in Medicine (FSM). One of the two ARCH reviewers contracted was a FSM Supporter. Despite claiming it observed conflicts of interest policy, NHMRC did not disclose (and therefore did not manage) the major conflict associated with this group. This was despite having appointed a FSM Supporter as the initial Chair of the HWC, without disclosing the fact or formally managing the conflict for the duration of the Review (see 'Conflicts of interest' section). Details of how NHMRC evaluated externally submitted evidence differently from the original 176 trials has been discussed above, but it should be noted that for most of these studies this is actually a moot point, as their results could never have entered the Homeopathy Review, however they had been analysed. This is because 27 of the 49 ‘suitable’ trials submitted by external parties were entirely dismissed due to being ‘self-selected samples’ (3/9 studies submitted by the homeopathy sector in July 2011 and 24/40 studies submitted during public consultation in June 2014); the remaining 22 were ‘downgraded’ for the same reason. "However, this is a self-selected study and other literature concerning the effectiveness of homeopathy for [this health condition] has not been systematically retrieved". The ARCH assessed the submitted trials differently from Optum, as they differentiated between trials conducted on health conditions already included in the Overview Report (not dismissed due to self-selection bias because Optum had systematically retrieved evidence on that condition) and trials on health conditions that were not already included in the Overview Report (the 24/40 trials dismissed). The phrase ‘self-selected sample’ refers (correctly) to the fact that submitted trials are subject to ‘self-selection bias’ i.e. having been chosen by pro-homeopathy organisations or individuals, the studies are more likely to be positive and may not accurately reflect the wider body of evidence available on the topic. This is supported by ARCH’s assessment that 37 of 40 of the submitted studies reported benefits from homeopathy37p.13. However, this bias could easily have been removed by carrying out a systematic literature search for all other trials on the same topic as those submitted, but NHMRC chose not to do this. For example, one of the 9 trials submitted by the homeopathy sector that was ‘downgraded’ due to self-selection bias was a pilot study (N=81) in which the original authors state that they found individualised homeopathic treatment to be as effective as conventional care for the treatment of otitis media in children. For this study not to be at risk of bias from being self-selected, NHMRC would only have needed to carry out a literature search for studies on homeopathy for the treatment of otitis media in children, published more recently than those captured in the systematic reviews they had already assessed. This would have taken a matter of hours at most. “A further limitation of the overview process is that no attempt was made to systematically identify any recent Level II studies that may not have been included in a systematic review, but met the inclusion criteria described in the primary clinical research question. An additional report was produced by the evidence reviewer that accompanies this Overview Report that considers the evidence from literature submitted to NHMRC in 2011 by the Australian Homoeopathy Association, the Australian Medical Fellowship of Homeopathy and members of the public that was not otherwise considered in the Overview Report. The ‘Review of Submitted Literature’ identified eight Level II studies and one Level III-2 study that were not included in the Overview Report. However, these studies remain a self-selected sample and other literature concerning the effectiveness of homeopathy for a specific clinical condition has not been systematically retrieved” (p.286, our emphasis). This means that due to NHMRC’s own chosen methods, it was not possible for any of the 49 submitted studies to affect the Review results; even if NHMRC assessed a submitted trial as being both ‘reliable’ and ‘positive’ (i.e. showing that homeopathy is effective), because it was assessed as a ‘self-selected sample’ and thus having a high ‘risk of bias’, it would not be “considered further”. In terms of public perception of NHMRC’s process, it is interesting to note that NHMRC mention that they considered submissions of evidence by homeopathy interest groups six times in the 40 page Information Paper; by contrast, the fact that all their submitted evidence was excluded from the Overview due to being categorised as self-selected samples, is not mentioned at all in the Information Paper. It was NHMRC’s own choice not to systematically search for and identify all individual trials on homeopathy which met their criteria, but were not present in SRs, relying instead on external submissions. It is therefore astonishing to find that they then use this lack of systematic search as a reason to dismiss all trials submitted by homeopathy interest groups and the majority of studies submitted via public consultation, making a sham of this apparent attempt at external co-operation and transparency. None of the three expert reviewers NHMRC appointed in 2014 to provide expert peer review “to ensure that the evidence had been accurately interpreted” (IP, p.15) had any subject or research expertise in homeopathy. FOI returns reveal that a HWC member protested the lack of homeopathy discipline/ research expertise amongst the reviewers selected. At the meeting, ONHMRC noted that if a homeopathy research expert was appointed as one of the reviewers, their comments ‘may have to be published’ - voicing NHMRC’s concern that a subject expert would identify legitimate problems (a clear expression of bias). This was consistent with NHMRC having ignored the requirements of its own 'quality assurance process', which mandates that members with subject expertise must be included in NHMRC expert committees (as above). FOI returns reveal that post-public consultation phase, the HWC decided to retrospectively describe the Review as a ‘Health Technology Assessment’, for the specific purpose of attempting to counter criticism received from public consultation feedback regarding the exclusion of homeopathy subject and research experts from the Review process. NHMRC had not referred to the Review as a ‘HTA,’ or even “like” a HTA at any point prior to June 2014: the argument was fabricated, inaccurate and highly misleading to the public and other stakeholders. In the first instance, NHMRC was explicitly clear that it conducted an ‘Overview’ under the Review’s Terms of Reference, not a ‘HTA’, using a method “derived from Chapter 22 of the Cochrane Handbook of Systematic Reviews of Interventions” (Overview Report, p.12; IP, p.11). These are entirely different research processes conducted for different purposes. HTA is a form of policy research that examines short- and long-term consequences of the application of a health-care technology. Properties assessed include evidence of ‘safety’, ‘efficacy’, ‘patient-reported outcomes’, ‘real-world effectiveness’, ‘cost’, and ‘cost-effectiveness’ as well as social, legal, ethical, and political impacts. The Department of Health’s definition of HTA is consistent with this. NHMRC excluded all these customary HTA parameters from scope of the Review, except ‘efficacy’. Thus, NHMRC’s ‘Overview’ bears no resemblance to a HTA. The HWC was not a HTA committee and the ‘other HTA committees’ NHMRC provided as examples in fact contain a wide array of subject and clinical experts in their respective fields - as required by their terms of reference (e.g. the Therapeutic Goods Administration’s Advisory Committee on Complementary Medicines). The NHMRC ‘Clinical Practice Guidelines Portal’ does not include any HTAs, but includes all other types of publications produced and endorsed by NHMRC. NHMRC did not even attempt to justify these irregularities when challenged by stakeholders in 2015. ​Whereas the Review was not a HTA and the null hypothesis was retrospectively introduced to 'assume homeopathy is ineffective unless 'reliable' evidence shows otherwise'; with NHMRC then embarking on a process of developing the criteria that defined its unique concept of 'reliable' evidence, which was then retrospectively applied to the data resulting in 171/176 studies being dismissed from consideration in the findings. Independent analysis of NHMRC's methods, in Complaint to the Commonwealth Ombudsman. ​ NHMRC response to Complementary Medicines Australia re. 30.09.15 preliminary stakeholder submission of complaint to NHMRC, 22 Dec 2015. ​ NHMRC Information Paper, p.34 & 37; Australasian Cochrane Centre second round methodological review, 30 Aug 2013. NHMRC 2015/16 008-13. "I am concerned that no homeopathic expert was appointed to the NHMRC Review Panel. I cannot imagine this being agreed in oncology, orthopaedics or other disciplines." None of the criteria developed during the April-June 2013 HWC Sub-Group process existed in the original research protocol (Dec 2012), yet they underpinned the Review's published findings and NHMRC's overall conclusion about homeopathy. NHMRC regularly funds and collaborates on trials with less than 150 trial participants - that are not deemed 'unreliable'. ​"However, because our results were based on meta-analyses of trials assessing binary outcomes, they cannot be extrapolated to trials assessing continuous outcomes"
The full evidence base for individualised homeopathic treatment of children with diarrhoea.